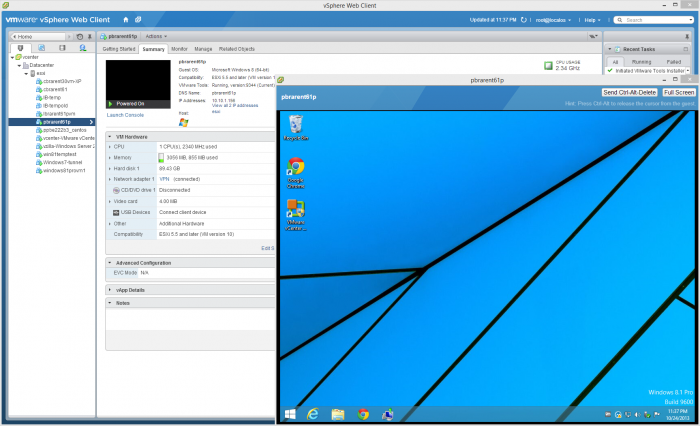 If you have a home lab, it's likely you already discovered how handy it can be to have VMware Converter in your virtual tool bag. Want to take an ancient laptop, and wish to breath new life into for occasional use as a VM instead? Wishing you could resurrecting that slow "spinny" drive in a much faster virtual machine? 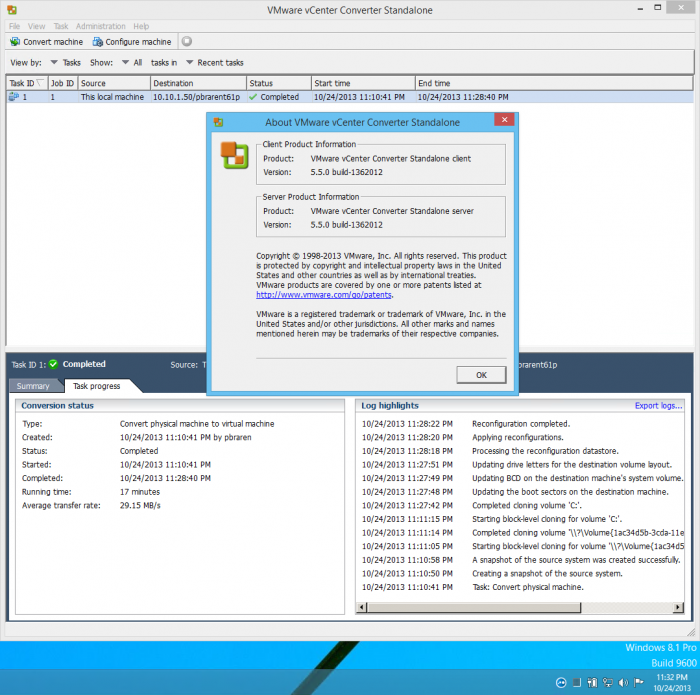 Then VMware Converter is likely a piece of Windows software that you'll want to check out. Install it somewhere on your home network, and as long as that system you install converter on can reach the physical machine on your same network, the process of converting it into an ESXi 5.5 based VM is pretty straight forward. With >2TB drives becoming commonplace, it sure is good that VMware has kept developing this valuable bit of software. where you'll be prompted for your VMware credentials, or offered a chance to register if you haven't already, also for free. Now that the download is underway, you now have time to read up on all that's new about this 5.5 version of Converter. The items that caught my eye in particular? You can perform only volume-based cloning on the block level. You cannot use ReFS-formatted volumes in incremental updates. You cannot shrink or expand ReFS-formatted volumes. ANNOUNCEMENT: Converter 5.5 is now GA! What's New in Converter 5.5? Want to go deeper? Here's documentation and more! I already had a chance to kick the tires, and I did have some issues, but ultimately prevailed. Then again, I was kind of asking for trouble, trying this on Windows 8.1 after all, which technically isn't on the list of supported OSs. To get converter to work converting an 8.1 laptop, I quickly found I had to install VMware Converter 5.5 on the Windows 8.1 Pro x64 laptop itself. Why? Because any attempts to convert other 8.1 machines on the same network from my own Windows 8.1 laptop failed, even after I got past some firewall issues. Once I had it installed just fine on the Lenovo T61p laptop, and ran Converter as Administrator, and things began to go smoother. Well, until I got stuck with strange errors when trying to use the converter pointed to the vCenter. Not a great idea, or best practices, I know, but the only reason I was trying to convert through vCenter was because I couldn't convert directly to the ESXi host either. It had complained about vCenter managing it. So what did I do? Simply disconnected vCenter from ESXi (temporarily), then the conversion ran fine, finishing up about 30GB of data transfer in only 20 minutes (over Gigabit wired connection). I then reconnected vCenter 5.5 to it's ESXi 5.5 host again. Tada! Until I discovered I have a VM that needs license key reactivation, and seems to have a keyboard issue at the moment. Hmm, will try again to get it going another day, time to throw in the towel for now. Increasing the cloning performance of VMware Converter 5.0 on TinkerTry.com Fri Dec 16 2011. All these little quirks will be worked out or worked around, and don't let any of this convince you to not try it out, where it's likely to work just fine on your typical Windows 7 or Windows 8 system.